Fixing a clogged drain is hard work and expensive. Making a drain trap is easier and cheaper than you might think. In this post, an excerpt from the April 2014 issue of Ceramics Monthly, Raquel and Dan Sobel explain how to make a clay trap from inexpensive and readily available materials. Give it a try in your own studio. It could save you a lot of trouble.- Jennifer Poellot Harnetty, editor. I was a little nervous about setting up my own studio in the basement of my house with a 20-year-old septic tank and leach field, so I wanted to make sure my clay trap was really safe. After researching the subject on the Internet I came across two methods, both with two buckets. Method A used one bucket inside the other and Method B used the two buckets in series. I decided to create (with the help of my engineer son) a more effective clay trap combining these methods. 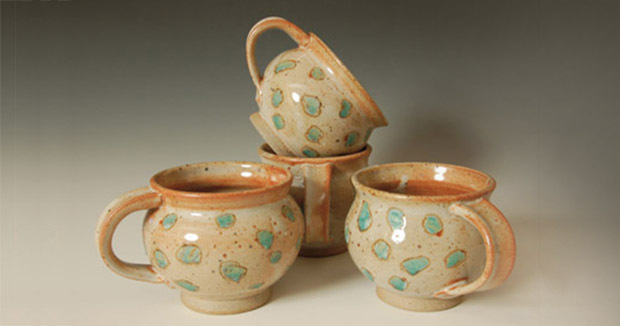 This new release, by veteran ceramic artist Robert Harrison, sheds a light on the latest studio practices needed to operate responsibly in a changing environment. Discover the latest developments in managing your studio resources from materials to firing. Robert, a key leader of NCECA’s Green Task Force brings together a wealth of information every responsible potter should be aware of. My system consists of one large plastic tote box with two smaller buckets inside it. The water flows through the system from bucket to bucket, creating three sediment settling stages. From the sink, the water flows into the first small bucket, then into the second small bucket. It exits the second bucket via a cluster of small holes into the large tote box, from which it flows to the outlet pipe on the opposite side. This setup ensures that a minimal amount of clay will enter my drainage pipes. It is critical that the exit hole is lower than the entrance hole in each container and that the pipes are all slanted slightly downward so that the water flows through the system correctly. I also recommend placing the exit holes on the opposite side of the container from the inlet hole to allow the sediment to settle properly. The drainage pipe out of my house is higher than my clay trap discharge pipe so I had to pump the water to the sewer line in my basement using a sink utility pump. This clay trap has been effectively saving my pipes and septic tank for almost a year now. Sediment builds up in all three stages, but in lower quantities in the later stages. The easily removable lid keeps the odor minimal, while allowing for easy access to periodically remove the settled clay. Lay out the buckets in their intended positions. If needed, a pallet or 2×4s can be placed under the tote to raise it to the proper height. Mark where the holes should be drilled based on the reference diagram. Remember that the pipes need to be slightly slanted so that water flows in the correct direction. In general, the inlet hole should be at least ½ inch above the outlet hole for each container. On the first small bucket, use the 1½-inch-diameter hole saw to drill the holes on opposites walls and opposite ends of the bucket. The first hole should be as high as possible on this bucket. On the second small bucket, drill the 1½-inch-inlet hole on the side next to the other small bucket hole and drill around 10 small drainage holes using a ¼-inch-drill bit in the side wall opposite the drainage from the big tote. On the large tote box, drill one 1½-inch-hole to allow the pipe from the sink to the first small bucket to pass through, and one hole for the pipe leading out to the drainage connection. Assemble the PVC pipes from the sink through the tote into the first small bucket, from the first small bucket to the second small bucket, and from the tote to the outlet drain. Apply the PVC primer and cement according to directions on the containers to glue the pipes in place. It is best to have a professional plumber connect the clay trap to the sink and to the outlet drain. Use silicon sealant to seal all the holes after the pipes are in place. Finally, use a sink strainer to prevent large items from entering the pipes. I use a similar method myself that enters bucked directly from above. To clean trap simply remove pvc drain section that is cut in two but is connected via a rubber Fernco. A rubber hose like union that has 2 hose clamps on each end. You can find Ferncos at any hardware store. I used a 5 gal bucket in my utility sink. I drilled several 1/2 inch holes, around the top of the bucket 3 inches from the top. I washed my tools etc under the faucet over this bucket. The clay materials washed into the bucket but clean water went out the holes. I could then clean out the bucket periodically by letting it sit overnight, dumping the clean water from the top, and simply lifting the bucket out. This worked fine for over 5 years. An even simpler trap solution is to just place large plastic flat-bottom bowl in sink at an angle, resting bottom edge in the drain opening and top against sink edge. Wash all tools and brushes over this bowl and sediment collects in the water of the bowl. Simply dump the bowl when level is too high. For a small studio this is a quick, cheap, and easy solution. Although one empties it quicker, it also avoids having to carry a heavy large container of water and sediment. I like this idea and think Alexis has a fair comment. What about making the inlet pipe of the first bucket go in the top of it. Then use the same principle for the second bucket – use a smaller bucket and have the output of the first (glued in place) enter the second over the top of the bucket. That way neither of the buckets are actually joined. I like your idea. Question: if the pipes are glued in place, how do you removed the buckets to empty the clay sediment when needed?